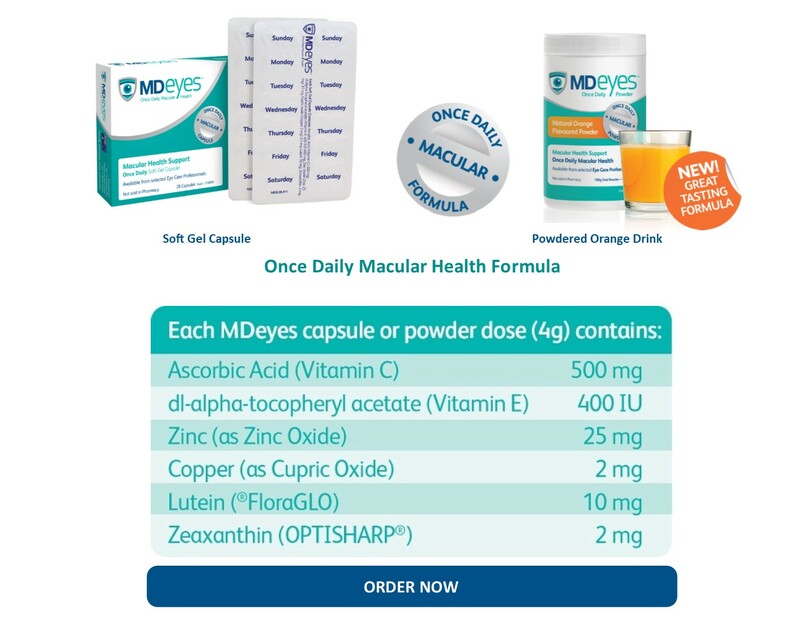 MDeyes Once Daily Macular Defence for Eyes. MDeyes is a high quality macular health supplement based on current research into nutritional supplementation in eye health. The formula delivers a complete Once Daily dosage and is available as either a convenient and affordable Once Daily soft gel capsule, or as a great-tasting Once Daily powdered orange drink. 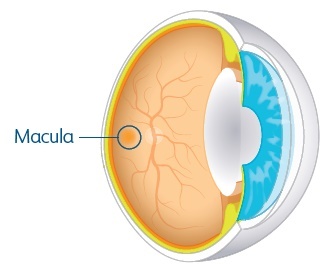 The macula is a small spot in the centre of the retina that processes sharp, clear, central vision. When you look directly at something, light is focused on the macula, allowing you to see detail and colour. Reading, driving, watching television, recognizing faces – all of these abilities are dependent on a healthy macula. Research indicates antioxidant nutrients and Zinc, together with Lutein and Zeaxanthin, may help support the protective macular pigment of the retina. MDeyes is a product of MD EyeCare Pty Ltd, an Australian private healthcare company dedicated to developing specialist eye formulations that are supported by research. Our products are encapsulated in a leading Australian pharmaceutical facility under the highest manufacturing standard using only premium quality ingredients. MD EyeCare products are made available direct to customers, providing evidence-based, high quality eye products at affordable prices. Supported by a dedicated and friendly customer care team, our company strives to deliver the best possible customer service, at the best possible prices. We even provide Express Delivery to our WA customers to ensure they recieve their parcels in a timely manner. At MD EyeCare, we are passionate about eye health. Improving eye health outcomes in the wider and global community is very important to us. We proudly support the dedicated hard work of Sight For All Vision 1000 and Optometry Giving Sight.